What is Goat Milk Soap? Goat milk soap is a wonderful choice for those looking for a natural soap that leaves skin feeling moist, supple and healthy. Soaps made from goat milk provide long lasting health benefits with regular use and are ideal for people with very sensitive skin or serious skin conditions such as psoriasis. However, everyone can benefit from switching to goat milk soap permanently. This soap is rich in Alpha Hydroxy Acids, which can help with the removal of dead skin cells and the development of healthy, younger-looking skin. This can also affect those suffering from skin conditions by lowering the irritation that might cause part of the discomfort. It is also rich in minerals and vitamins, particularly in Vitamin A, which helps with the repair of damaged skin and even helps to control acne, lines and wrinkles and to ease the discomfort, such as itching, caused by many skin conditions. One of the reasons goat milk soap pampers the skin so much is because it is said to have the same pH balance as human skin. This protects the skin from the bacterial and chemical attacks it must deal with on a daily basis. It contains caprylic or capric triglyceride, an emollient that helps the skin stay moisturized since it is absorbed very quickly and coats the skin with a very light layer of protective moisture. Goat milk soap is also rich in glycerin and while many soap makers remove the glycerin from their soaps to sell separately, goat milk soap makers keep it so that the soap is highly moisturizing. 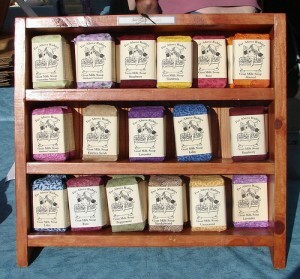 Goat milk soap makers also often add fragrance to their soaps. The fragrances come from essential oils, which are natural oils that are extracted from plants. Some makers also add color to enhance the soap aesthetically. Others sometimes add oatmeal and honey as a skin soothing agent or ground almonds for exfoliation. If you have not yet treated yourself to a bar of goat milk soap, give it a try. You’ll be glad you did and your skin will thank you. August 19, 2013 | Posted by Lee C.
It is easy for your linen closet to get out of hand. Sheets get stacked up and shoved to the back and towels come toppling over when they are touched. It only takes a little time to clean out and organize your linen closet. When you have a system, it will stay neater longer and you won’t accumulate unnecessary items. First pull out all of the items you don’t use anymore. Get rid of old towels, sheets and other items by donating them or cutting them down into rags. Store the rags in the garage or laundry room where they are handy for cleaning. Real Simple recommends retiring a sheet set or towel set every time you buy a new set. That way old sheets won’t pile up in the back of the closet. Here are some great ideas for what to do with old sheets. You can put seasonal items in boxes or large zippered cloth bags so they don’t get dusty or musty while you are not using them. For example, during the summer fold up your flannel sheets and wool blankets and place them in a bag. Store these items at the top or back of your linen closet because you won’t pull them out that often. 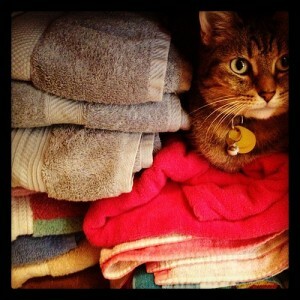 Place towels at eye level where they are easy to reach. Regularly used sheet sets can go nearby. You may want to keep pillow cases in a separate pile from your matched sheet sets as they are sometimes changed more frequently. Put guest sheets, and other items that are used less frequently on the lower shelves or towards the back. If you put anything in storage tubs or bags be sure to label them so that you won’t have to dig through each one to find what you need. Country Living also suggests using stylish cloth baskets or wire bins to keep smaller loose items and toiletries together. To prevent musty smells or other unwanted odors in your linen closet fill yogurt or sour cream containers with baking soda and poke holes in the lids. Place one container on each shelf to keep your closet fresh. When you want your linens to have a fresh scent place a sachet or a few cedar balls on each shelf as well. Remember the key to having an organized closet is to get rid of or repurpose items you don’t use. Don’t be afraid to replace old linens and give away towels and linens you have been holding on to. Keep you closet fresh by keeping regularly used items where they are easy to grab. Finally, label as much as possible to keep searching to a minimum. A few hours of work can help you have a fresh linen closet that, with the right system in place, will stay fresh and organized. In the summer heat, air conditioning is a necessity in many homes. However, air conditioning can be quite costly, and keeping cool can take its toll on your wallet. There are a few ways you can stay cool and minimize energy costs. Basements are naturally cooler, so if you have basement vents, choose which ones to close off so that the cooler air goes to the parts of your house that need it. Also, close off vents located in any unused rooms, such as a guest room. You don’t need spend money cooling spaces that don’t need to be cool. Make sure your air conditioner filter is clean. It may need to be changed about every three months, but you should check it once a month to make sure it is clean. You should also have your heating and air units serviced by a professional once a year. 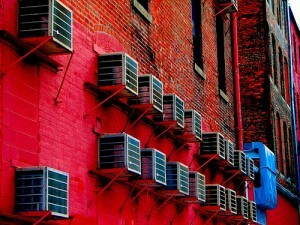 Correcting any problems will make sure your air conditioner is running as efficiently as possible. If you can tolerate the temperature being a bit warmer, turn it up a degree or two more. According to ‘Do It Yourself Life’, For every degree above 78, you’ll save 5 to 8 percent on cooling costs.” Turning the thermostat up when you are away from home for a few hours will also help to save on cooling costs. You can also turn up your thermostat a bit at night. Use these tips to keep your bed cooler and more comfortable while you sleep. Fans will help circulate air when the air conditioner is not running. They will help you feel cooler even when the air conditioner is running and the thermostat is set a bit higher. Close your window shades or drapes during the hottest part of the day. Blocking the sun when it is shining directly through your windows will keep temperatures cooler in your home. If you want natural light, open up curtains as the sun moves and is no longer shining directly in your windows. It is important to feel comfortable in your home during the summer. Using these few tricks will help you stay cool and cut back a bit on high energy bills. August 3, 2013 | Posted by Lee C.
You may have seen melatonin sold as supplements or even in snacks, such as brownies, but what is it and is it safe? The University of Maryland Medical Center discuses that melatonin is a hormone found in the body that helps a person sleep. This hormone regulates your internal clock, also known as the circadian rhythm. Melatonin levels increase closer to nighttime, remain high during the night and then taper towards morning. People with low levels of melatonin may have difficulty sleeping. Melatonin also plays a role in regulating other hormones in the body. There are many factors that effect melatonin production. WebMD discuses one factor, sunlight. Sunlight can prohibit the production of melatonin and lack of sunlight can increase melatonin. This makes it difficult for shift workers to sleep during the day. It may also contribute to seasonal depression in the winter, as melatonin levels remain higher longer with shorter days. It is also theorized that age plays a role in melatonin production. Children produce the most during the night and older adults the least, often causing aging adults to have difficulty sleeping. If you have trouble sleeping falling asleep at night, try reducing the amount of sunlight you are exposed to in the evening. If you live in areas where the sun sets late during the summertime, close you blinds earlier and dim the lights. Less light may trigger your melatonin production, helping you to fall asleep faster. If you must sleep during the day, try to avoid sunlight and make your room as dark as possible. Melatonin can be taken as a supplement to help with insomnia, but researchers are still studying its effectiveness and its long term side effects. Melatonin is also used to help people cope with jet lag and shift work. Dr. Brent Bauer of Mayo Clinic warns that taking melatonin supplements can cause daytime sleepiness, dizziness and headaches and should only be taken for short term periods. Melatonin can be purchased over the counter, but if you are considering using it to help you sleep, be sure and discuss it with your doctor first. Melatonin can have adverse or unknown reactions with other prescribed medications. If you are having trouble sleeping, melatonin may be a short term solution, but be aware that the medical community is still wary of its use and the supplements are not regulated by the Food and Drug Administration.